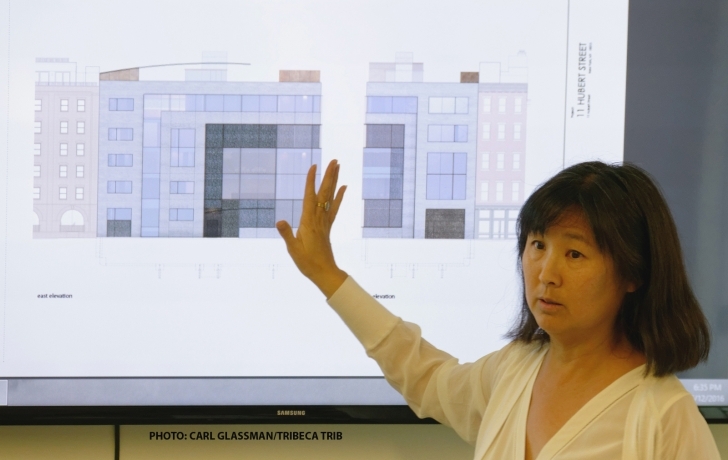 Maya Lin has revealed her reworked and unabashed contemporary design for a five-story mansion to wrap around the corner of Hubert and Collister Streets in Tribeca’s historic district. In collaboration with Tribeca-based architect William Bialosky, Lin refashioned the look of the five-story, 20,000-square-feet home at 11 Hubert Street after a bruising critique of her first design, presented by Bialosky to Community Board 1’s Tribeca Committee in January. The committee had complained that the design was a poor fit for the Tribeca West Historic district. Following her presentation on May 12, they embraced it. Lin, who had not been present at that meeting, led the committee through her changes to the building, convincing them that the materials and building proportions she now proposes make the mansion a sympathetic addition to the neighborhood’s historically industrial streetscape. “The facade has gotten quite complex,” said Lin, who is best known for her design of the Vietnam Veterans Memorial in Washington, D.C.
What had been largely a flat exterior of stone and metal paneling is now a melange of surfaces and depths: brick and flat granite; some windows covered with brass screens, others with a frit of brass-colored dots baked into the glass, still others unembellished. A 1937 photo shows a six-story warehouse on the site (torn down a few years later for a one-story garage) and Lin said she sees the new building as “restoring the height and going back to the original scale of what was there.” A 1980s stucco, three-story mixed-use building, with a gap above the garage on the Hubert Street side, now stands on the site. “I’ve always thought that [the current building] left a really open corner that felt a little awkward in the space,” she said. Lin and Bialosky say the new design mimics the proportions of the original warehouse building, its large windows recalling the manufacturing buildings that required much more light. (Lin called it a “homage to a cast iron facade.”) But framed within it is what they see as reflecting the narrower, 25-foot width of residential buildings from an earlier period. The committee, advisory to the Landmarks Preservation Commission, agreed that she succeeded. Only committee co-chair Bruce Ehrmann had reservations, though he voted to approve the design. “I do think your building is so much better now, but still it is a bit much,” he said. The home, whose buyer has not been publicly identified, is estimated by Bialosky to cost $15 million to $16 million. Its floor plans call for 11 bathrooms, five bedrooms (including two guest rooms), a dog room, separate prep and catering kitchens, wine closet and two bars, screening room, his-and-her studies, fully landscaped courtyard, 5,000-square-foot sports and fitness center in the basement, and a garage. A rooftop garden would be topped by a curvy trellis of solar panels. Lin is expected to present the plan to the Landmarks Commission on June 21.